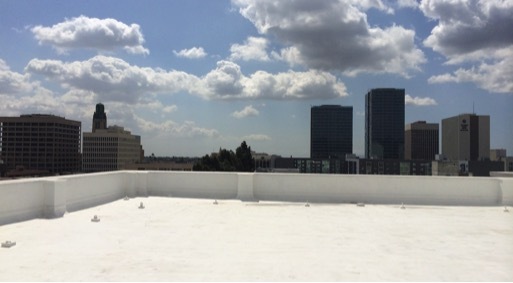 Foam roofs are commonly used in many commercial, industrial and institutional flat roof settings. They do require some ongoing maintenance but the benefit is that they provide an additional layer of insulation. Plus, certain foam roof products are even ENERGY STAR®-rated, which can help reduce ongoing heating and cooling costs for your building. Your foam roof maintenance program should include regular inspection and repair as needed. While foam roofs can last 25 years, periodic recoating will keep your roof in good repair and let you enjoy all the benefits of an effective and energy-efficient foam roof system. Foam roofs should be recoated every 5-10 years, depending on the quantity and quality of coating previously installed. 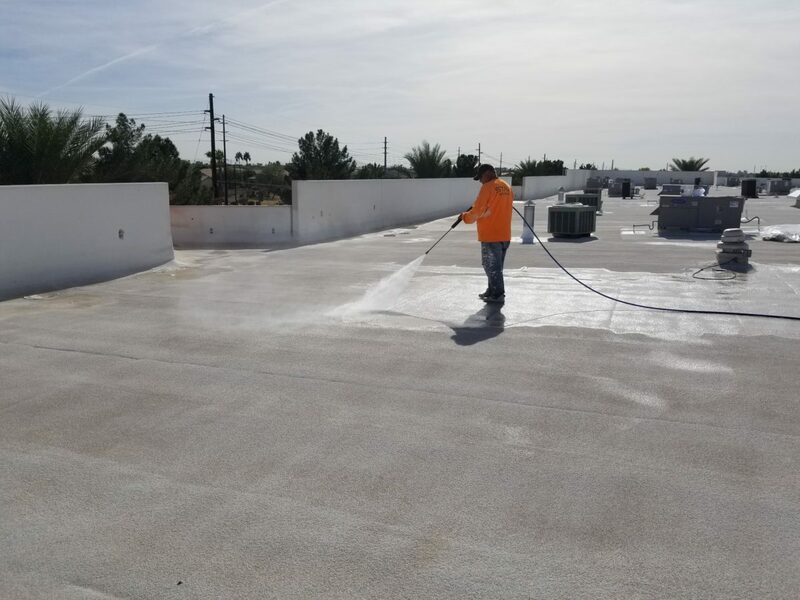 Although the entire roof system can last more than two decades, the foam roof coating will deteriorate over time, since it is exposed to the elements. Weathering can form small pits in the coating as it ages. The process is gradual and may not be immediately visible, but if the pit becomes a hole where water can enter, the whole roof will need to be replaced. Before you begin recoating your foam roof, a thorough inspection of the whole surface is required. This includes a visual inspection for obvious cracks, peeling, ponding or staining. In particular, have a look around HVAC units, exhausts or anywhere a joint or cut was made, as these will typically be the weakest points and most susceptible to damage. Once the visual inspection is complete, a more in-depth inspection, using an infrared scanner or FLIR camera, may be required to identify ‘hot spots’ where insulation is failing or where water has entered the building. The contractor may also need to make test cuts to make sure previous layers of foam roof coating are still adhering and maintaining air- and water-tightness. Once the full inspection is complete, but before recoating can take place, you need to complete any necessary repairs. This can include patching splits and blisters with a product like Western Colloid Elastic Cement and removing any out-of-use equipment. The cleaner your foam roof system is, the more resistant it will be to future weather and environmental damage. If water damage or water intrusion is discovered, your contractor may need to remove and replace whole sections of the roof or even the entire roof system. Once the damaged material has been removed, give the area sufficient time to dry before sealing to prevent further damage and limit the potential for mold growth. When repairing your foam roof, choose a foam kit, roof cement, flashing compound or elastic cement that is compatible with your foam roof coating and other roof system materials. Give patches and repairs sufficient time to cure and ensure new seals and seams are water-tight before you start recoating. Before applying a new coating, the first step is to remove any debris, thoroughly clean your roof with a blower and broom or a pressure washer. Suitable detergents can be used to clean off any grease or oil. Give your clean roof time to dry before applying your first layer of coating. 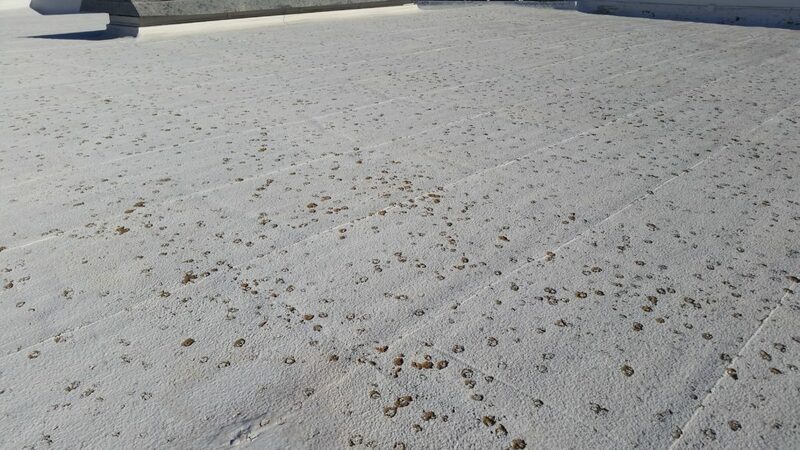 Products like Western Colloid’s Fluid Applied Reinforced Roofing (FARR) System can be used with BUR, Modified Bitumen, Single Ply, Metal Roofing, Sprayed Polyurethane Foam and gravel roofs. Recoating should be done only under the right weather conditions. Consult your product specifications or manufacturer’s representative for the right temperature range for application. As with all roof work, safety needs to be carefully considered during all phases of your foam roof repair and recoating. Make sure contractors are following legislated safety procedures, as well as any specific roof safety protocols your facility operators may have. Western Colloid’s FARR Systems have the added benefit of being water-based. They are non-toxic and harmless to the environment. 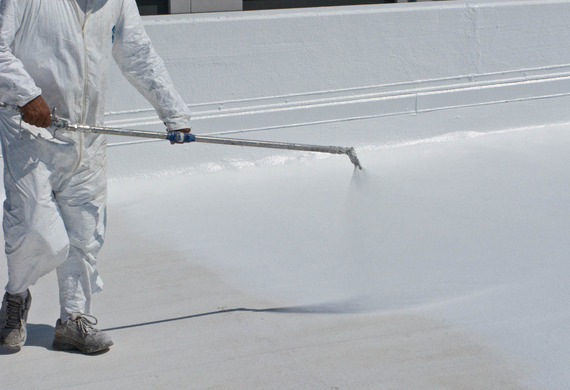 A fume-free product is safer for the workers applying it and means that recoating can happen even while the building is occupied.For more information on choosing the right foam roof coating, and how to properly maintain your foam roof system, visit the Western Colloid website.